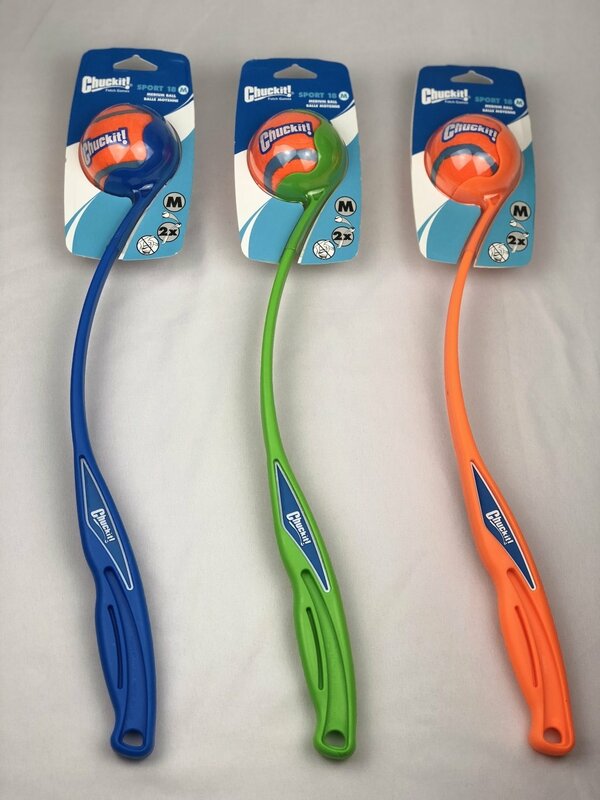 With its high performance control grip handle you'll use the Chuckit! Pro Launcher Dog Toy to throw the ball two to three times further than you can alone (depending on which model you choose). Plus it picks up tennis balls tossed into mud or water during games of fetch. Caution: Use only standard tennis ball or Chuckit Brand balls manufactured for use with this product. High speed flying balls can cause injury to people or animals. Do not aim or throw directly at people or animals. Be alert, ball may travel in unanticipated directions. Not for indoor use. Supervised play only. Take care in selecting an appropriate play area and play style to avoid harm to people or animals. Know your dog and choose the most suitable size and type of toy to prevent choking or other harm. Inspect this toy regularly. If toy is damaged or if parts become separated, remove toy and parts as injury may result. Not a child's toy. Find an open area, away from people, animals and buildings. With the ball in the Chuckit!, grip the handle firmly. Extend your arm back over your shoulder until the ball is behind you. Then swing it forward in a smooth arc and follow through. The ball will release when you swing it fast enough. Hands Free Pick Up. Holding the handle of the Chuckit!, place the ball claw over the tennis ball and press down firmly.